I did this stage of my walk along the Harcamlow Way on Easter Sunday, 4th April 2010. When I had finished the previous stage I had envisaged parking at the church at Debden to start this stage however having looked at the road links it seemed far better to drive to Newport, that's the Essex one, and then walk back to my start point in Debden. It would mean less distance on the roads and also a shorter walk back to the car once I had finished the actual walk along the Harcamlow Way. 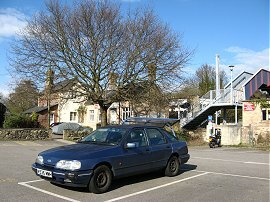 It had been raining in when I got up and there were intermittent showers on the way up to Newport but they had just stopped by the time I reached my parking place at Newport Station, photo 1, and as can be seen from the photos it gradually brightened up throughout the day. 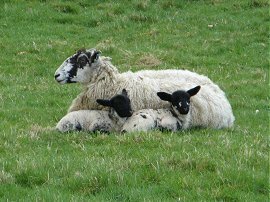 Like my last walk, there was a reasonably strong breeze blowing which kept the temperatures down and I kept my fleece zipped up all day. 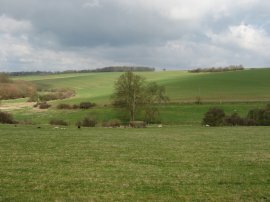 From the station I joined a byway that headed along a lane and uphill besides a large chalk pit. On top of the hill there was the first of three trig points that I passed during the walk, photo 2, another feature I could set up a dedicated page for if I ever had the time. 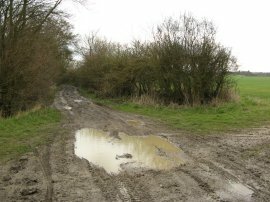 The byway briefly joined a road before continuing ahead along another byway by Waldegraves Farm. I ended up walking on a number of different byways during the day and this, like most of them, was well surfaced with no pot holes or mud. This byway eventually lead to Rook End Lane from where I soon joined a footpath on my left that headed over a small field and then alongside a very pleasant wooded area besides a stream. This lead to a path running besides Brocktons Plantation from where it was just a short distance back to the St Mary The Virgin & All Saints church where I resumed my walk along the Harcamlow Way along a path, photo 3, that runs besides the churchyard. At this point I had walked 2.86 miles from Newport. 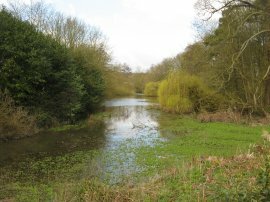 From the churchyard it was just a short walk down past a large boarded up brick barn to a large pond in the grounds of Debden Park, photo 4. Here the route turned to the left crossing over a small bridge before heading to the right through the grounds of the park, the route following the path in photo 5 all the way to the gap in the trees which is just visible on the horizon. Here the route turned to the right along a road that headed downhill with good views across to the left to where the path was heading. It was a fairly large road however there was enough grass verge to walk along for most of its length and it was not too busy on a Sunday morning. Reaching the bottom of the hill the route crosses a small stream before joining a driveway on the left. 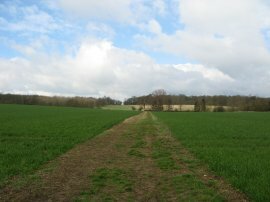 There are two footpaths here, the Harcamlow Way taking the footpath that heads off to the left which runs out in front of a house and out into the fields in photo 6. In one of the first fields there was a flock of sheep with lots of little black faced lambs, photo 7.The path more or less follows the route of a small stream, Debden Water, as it makes its way over the valley floor, at one point the footpath going through a very overgrown thicket of blackthorn which would probably be quite hard to walk through when the bushes are in full leaf. As mentioned before, the Harcamlow Way is a figure of eight path and reaching the edge of Bromleylane Plantation photo 8, I reached the point where the two sections of path meet up: not a particularly inspiring place but a significant point on the route and one I will be visiting again, hopefully in the not too distance future, although at the rate I'm currently progressing along the path who knows when! 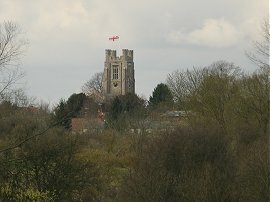 The two sections of the Harcamlow Way share a path for a few yards before one branch headed off over a bridge over Debden Water and I continued ahead towards the village of Newport, with the Church of St Mary the Virgin dominant on the skyline, photo 9, its flag blowing straight in the stiff breeze. 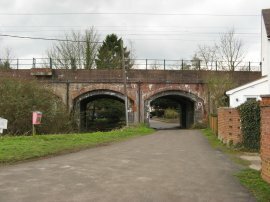 Just past a small sewage works the route crosses over the River Cam, close to its junction with Wicken Water and joins Water Lane on the outskirts of town which carries the route under the railway lines and up to the B1383. Here I headed to the right for a short distance before turning left up Bury Water Lane. 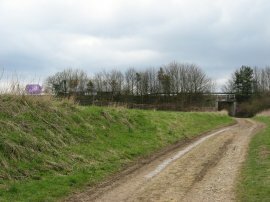 This heads past a large school and some houses before becoming an unsurfaced byway that heads out of the village towards the M11 motorway. 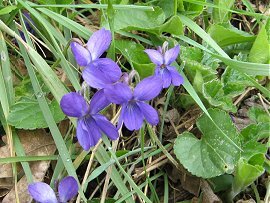 Close to the point where I stopped to take photo 11 of Bury Lane heading under the M11 there was a lovely bank of violets, photo 12. In a number of places I also passed some clumps of white violets although I was unable to get a decent photo of these. Once under the motorway the path becomes a farm track heading gently uphill between open fields, photo 13. 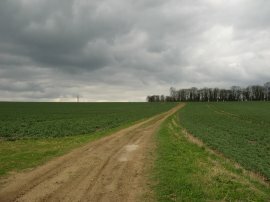 At this point I was walking more or less directly into the wind and with the clouds it felt quite chilly. As I ascended I could see the tall spire of the Saffron Walden church away to my right. 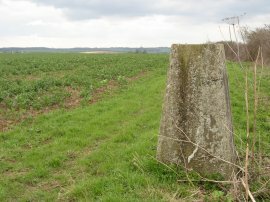 Reaching a junction of path I turned to my left along a field edge before making a slight detour along another field edge to my second trig point of the day, photo 14. I was now facing the way I had come and in the distance I could see a steady stream of planes coming in to land at Stansted Airport. 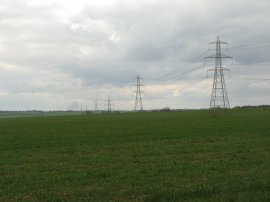 After a short break in the shelter of a hedge to eat a sandwich I continued on my way along a field edge path, passing under a long line of electricity pylons which stretched off into the distance on either side, photo 15, which I have since discovered originate from an electricity sub station near Furneux Pelham. 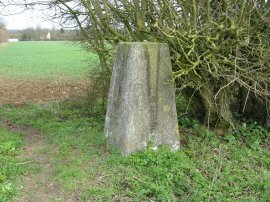 The route gradually made its way down towards the village of Arkesden, turning left along Wicken Road and then continuing into Hampit Road. 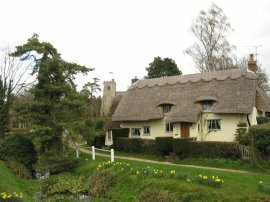 Arkesden is a small village with a number of attractive houses; there is a small stream that runs alongside the road and when I went through the banks were lined with daffodils, photo 16. Leaving the village the route of the Harcamlow Way on my map is signposted as joining a footpath on the left that runs over a field before cutting across a small to ditch to join the driveway that leads up to Chardwell Farm. While this footpath is marked from the road the area around the concrete sign was very overgrown and it leads through a newly planted hedge. There was no trace of the footpath across the field and although I followed the route as marked on the map I think the actual course just continues down the road for a few more yards before heading all the way up the driveway to the farm, rather than cutting diagonally across to it from the field. The route then skirts round the right hand side of the farmhouse and buildings before joining a field edge path on the top of the hill. Reaching a boundary the route turns left to begin heading downhill towards the buildings of Clavering Farm which are situated at the bottom of a shallow valley. Reaching the farm the path has been re-routed away from the main house, turning to the left to pass by a pond before heading up between some barns and out around the back of the house. 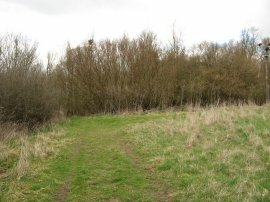 The route then joins a track that heads gently back uphill to reach Beards Lane which follows the route of an old Roman Road. Reaching the byway, photo 17, I decided to finish my walk along the Harcamlow Way having walked another 7.84 miles along the path. While the Harcamlow Way turns to the right I headed to the left along the byway heading down to join a road a Butts Green, where I turned to the right. As I was walking along the byway I was overtaken by a man cycling with a dog and I met up with them again on the road, the man holding the dogs lead in one hand and steering his bike with the other. Every time they caught up with me the dog suddenly stopped, almost pulling the man off his bike. I asked if the dog usually did that and he said no and he guessed that the dog might be more interested in what I was doing rather than continuing their walk. Eventually they headed off at a decent pace and I continued along the road till a corner where I continued ahead, following a footpath into a yard and then through a latched gate in a tall wooden fence that lead into a large garden. It is very unusual to have a footpath going through a fence that you cannot see over, in fact I'm not sure I can remember going through a similar gateway. Heading across the garden the path then heads out into fields, joining a field edge path that runs for some distance to join another minor road. 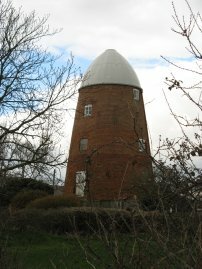 Here I turned to my right heading up the road for a short distance to pass by Clavering North Mill, photo 18, one of two old windmills a few hundred yards apart from each other. 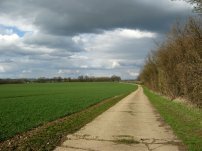 I joined another footpath on the left that ran besides the mill, heading out over more field to eventually join the B1038 just east of Clavering. Crossing over the road I joined a footpath that headed up a driveway between houses before once more entering open fields. The day now was starting to really brighten up however the strong wind still remained. Reaching a crossing path I turned left and followed this up to another trig point, photo 19, close to Moat farm. Here I turned right along a footpath although it is not marked on my map, before turning left down a tree lined bridleway that joins a footpath by the farm. 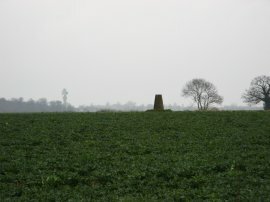 This is followed over two small fields to a road. 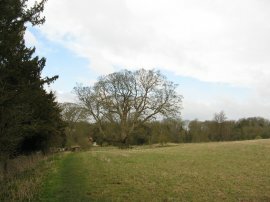 Here I turned to the left for a short distance before joining another footpath on the left that heads into the churchyard of Rickling Church, photo 20. 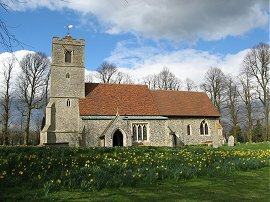 The church looked very picturesque in the sunshine, surrounded by daffodils and I was not the only person out taking photographs there. From the church I joined another well surfaced byway before taking a track on the right that headed down to join a concrete farm track, photo 21. Here I turned to the left following the farm track for some distance before eventually joining a path on the right that ran down to pass under the M11 motorway. The heel of my left foot had been feeling quite sore for some time and once under the motorway I stopped on a grassy bank to see if I could see, unsuccessfully, what irritating it. 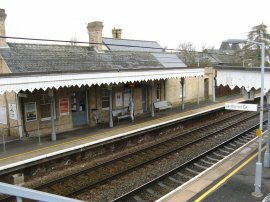 It did feel however I was developing a deep blister like had happened when I walked to Manningtree on the Essex Way last year which would be rather annoying as I am just starting to build my walking distances back up again. With my boot back on, and foot still painful, it was just a short walk back to the village of Newport where I turned right down Frambury Lane and then continued ahead into Station Road back to where my car was parked, photo 22. Reaching the car I had walked a total of 17.8 miles. I have uploaded the route of the walk which can be accessed here Harcamlow Way 5 Route.